fifty years ago the United States promised itself a good night's sleep. It eradicated bed bugs from all states. The bugs are back now. Business centres with many hotels are badly infested. Last time the National Pest Management Association, a non-profit with members from the pesticide industry, counted the bed bug population in 2005, it found they had multiplied fivefold since 1999. The US Environment Protection Agency was so alarmed that in April this year it organized a National Bed Bug Summit in Virginia. Entomologists and industry representatives from several countries compared notes on the elusive, nocturnal insect the size of a sesame seed. Turned out increased travel, reduced pesticide use and pesticide-resistant strains of bed bugs are helping it spread.People often acquire bugs at hotels, motels or at bed-and-breakfasts, and bring them home in their luggage. Attracted by warmth and high carbon dioxide levels, bed bugs (Cimex lectularus) feed on the blood of their host, usually humans and other warm blooded animals. Resurgence of bed bug populations has been reported in the UK, Germany, Spain, Australia and Canada as well. India has, however, dodged the trend. Bed bugs were a big problem in India until the 1970s. But now, entomologists say, they are a problem of the past. "This could be for two reasons. The jute mattresses used earlier were a favourable habitat for bed bugs. They have been replaced by synthetic mattresses," said Pardeep Kumar Chuneja, entomologist at Punjab Agricultural University. The second reason is widespread use of ddt in the malaria control programme. The pesticide has been linked with cancer. Among those present at the summit, Michael Potter, entomologist at University of Kentucky in the UK, attributed the rise in bed bug infestation to less effective pesticides. He said the solution to the problem is to let the pest control industry go to war. But that would mean lifting the ban on pesticides. Some are working on safer alternatives. Entomologists at Ohio State University and Wittenberg University have used chemicals secreted by the insects against the insects. These chemicals called alarm pheromones are secreted when insects are disturbed or excited. These were used with a combination of desiccants to kill the bed bugs. When a synthetic version of the alarm pheromones were tested the bugs moved away from the centre of application. Desiccants, placed in areas bugs moved out to, absorbed the water in their bodies, killing them. The researchers used a combination of two alarm pheromones, (E)-2-hexenal and (E)-2-octenal, and two desiccants, diatomaceous earth and silica gel. At least half the young bed bugs were dead in 10 days, and 60 per cent of adult female bed bugs died within 40 days. The researchers claim bed bugs would not become resistant to this method of control as they do to pesticides. "The bed bugs could become sensitized to the pheromones, but usually this type of resistance is not passed to the next generation," said Joshua Benoit, the lead author of the paper on the method published in the May issue of Journal of Medical Entomology. The idea struck him after he watched bed bugs respond to alarm pheromones in another study. But Benoit is reluctant to suggest the use of desiccant dust with alarm pheromones until more experiments. "Larger scale studies are needed to test if this method can be used in full-scale control," he said. Benoit, an expert on bed bugs in Ohio University, said the bugs have become obscure in India probably due to pesticide use. 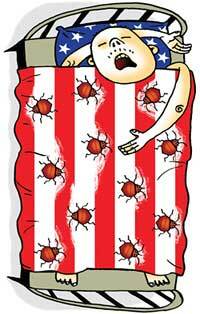 But could increase in temperature also be a reason behind the fall in the number of bed bugs in India? "Temperature has been used to kill bed bugs, but this is a continual exposure to temperatures around 40C. Slight temperature increases would not kill many bed bugs," Benoit pointed out. With increasing international travel, the bed bug resurgence can hit India and then Benoit's method of controlling the insect may come handy.